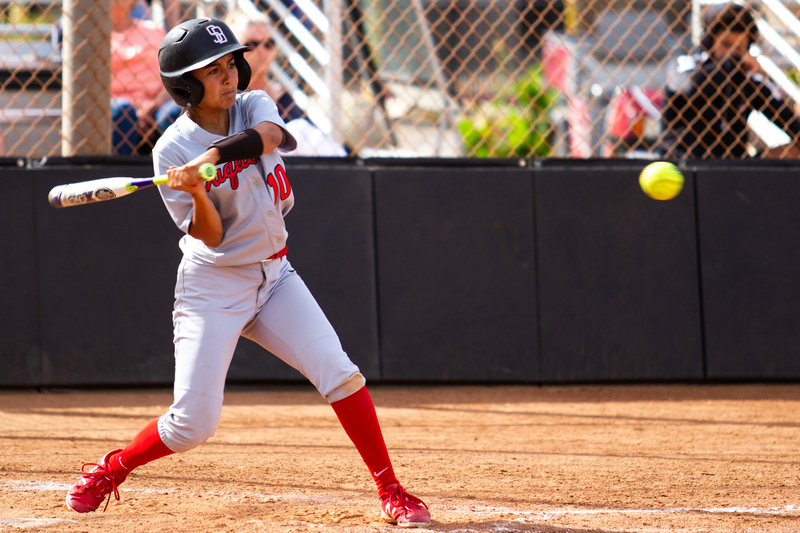 City College outfielder Kayana Diaz (No. 10) hits the ball against Moorpark College on Thursday, April 11, 2019, at Pershing Park in Santa Barbara, Calif. The Vaqueros won the match against the Raiders 11-7. 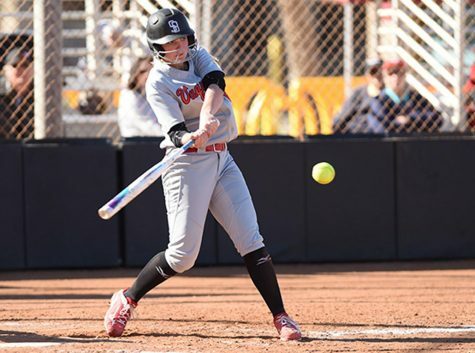 The City College women’s softball team won 11-7 Thursday against the Moorpark College Raiders. A hot and windy afternoon sparked a fire in the Vaqueros, who had previously lost against Moorpark on March 12 2-5. 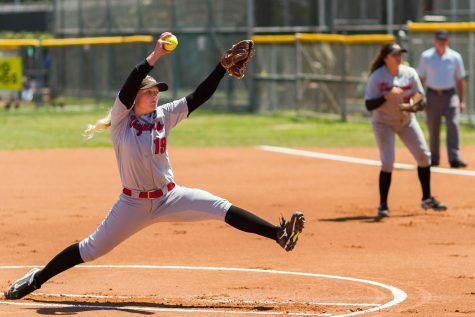 Moorpark currently stands second in the Western State Conference standings with nine wins and four loses while City College is tied for fifth with Santa Monica with six wins and seven loses. A fast section at the top of the sixth saw the first two batters on the Raiders side hit but the Vaqueros swift defense kicked in and tagged both players out at first. Powell then struck out the next two players at bat, leaving Moorpark with no players left on base and no runs. At the top of the seventh inning Powell was at the height of her pitching streak, and eliminated all three Raiders at bat one after another, leaving the Raiders with only seven total runs for the game. At the top of the fifth inning, the Raiders already had two runs when a player at bat hit a fly ball to center field. 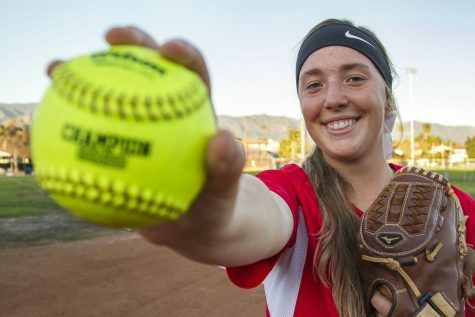 The ball landed in Janet Salas’ mitt, ending the inning and keeping the Raiders total runs down to seven. The Vaqueros fans went wild on the sideline for the spectacular play. The Vaqueros offense did well today with six doubles hit, two triples hit and a homerun for Emily Lonetree—her fourth this season. That home run was just at the beginning of the top of the fourth inning. The section saw Hannah Weaver hit a double and Kayana Diaz hit a triple. Both girls ran and so did Shelby Featherston. The Raiders switched pitchers last minute but the Vaqueros were already up 5-2. “We came back fighting,” Salas said. “We are learning never to give up through errors and strikes. 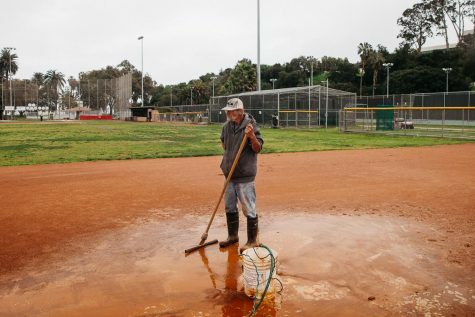 After record-breaking rainfall hampered practices and games early on in the season, the Vaqueros seemed to have found their footing, winning four out of the last six games in April. The Vaquero’s next home game is 2:30 p.m. April 16th at Pershing Park.